The Hong Kong Jewellers’ & Goldsmiths’ Association and the Kowloon Pearls, Precious Stones, Jade, Gold and Silver Ornament Merchants Association (collectively known as the Jewellers’ Associations), the Code is a set of self-monitoring measures for voluntary participation of the jewellery retail industry. 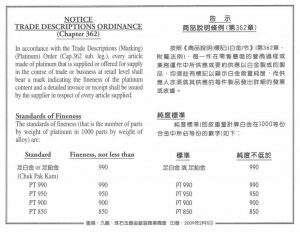 The Code sets out the basic service standards for the jewellery retail industry of Hong Kong, promotes good operation practices and fair market competition. Jewellery companies adopting the Code should first obtain consent from the Jewellers’ Associations. 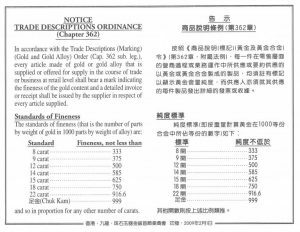 In line with the “Trade Descriptions (Marking) (Gold or Gold alloy) Order” promulgated by the Hong Kong Government, HKJGA and JEWMA launched the “Quality Gold Mark” Scheme in 1989, aiming to protect consumers’ rights and elevate the quality standard of the gold jewellery manufacturers. Representatives of both Associations will collect gold jewellery samples regularly from the participating merchants, and send them to the Hong Kong Government Laboratory for detailed examination. A Fineness Examination Group was also set up to supervise the operation of the Scheme. Sample taking and examination will be carried out from time to time within the valid period of the “Quality Gold Mark”. Consumers dubious about the fineness of the gold jewellery sold by any participating merchants may file a complaint to HKJGA and JEWMA, and the Fineness Examination Group will investigate the case based on the information provided. If the concerned merchants fail to meet the requirements on fineness, their “Quality Gold Marks” will be forfeited, and their memberships may be terminated in serious cases. 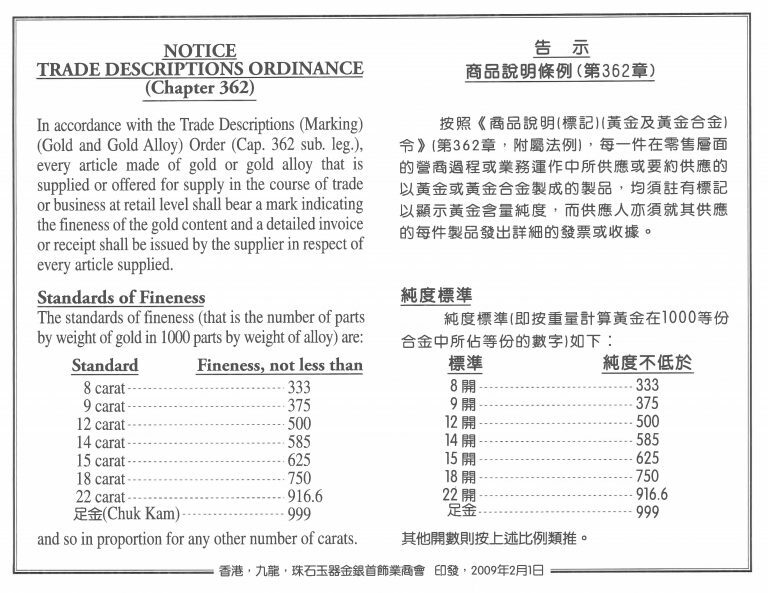 Merchants applying for the “Quality Gold Mark” must be members of HKJGA. Only merchants that have operated for at least six months are eligible to apply. However, branches of the exiting companies of the association can apply anytime. The application form must be signed by the person-in-charge and stamped with the company chop before submitting to HKJGA together with the annual membership fee. The test results will be reviewed by the Fineness Examination Group set up by HKJGA and KJMA, and the “Quality Gold Mark” will be granted to those meeting the requirements. If the Fineness Examination Group finds the results unsatisfactory and requests a re-testing, the concerned merchants shall allow the Group’s representatives to collect more samples for re-testing within the designated period, otherwise they will be deemed as giving up the application and shall bear the re-testing fee. The “Quality Gold Mark” will be valid for one year. Samples will be collected for testing every year, and only those meeting the requirements will receive the “Quality Gold Mark” to ensure their quality standard. As the “Quality Gold Mark” will be promoted through mass media, all applicants must pay a promotion fee. The difference will be borne by HKJGA. In case of any disputes with customers or complaints, the Fineness Examination Group has the right to request the concerned merchants to provide reasonable explanation. HKJGA also has the right to collect gold jewellery samples from such merchants for testing without their prior consent. The memberships of such merchants will be terminated and their “Quality Gold Marks” will be withdrawn if they fail the tests for three consecutive times. 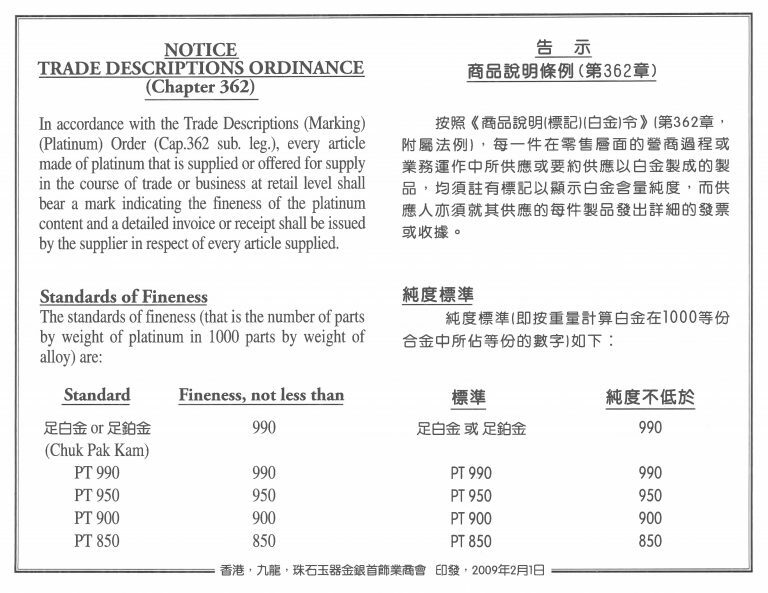 The complained merchants must accept the judgement of the Fineness Examination Group, or they may file an appeal to the Review Committee if they disagree with the judgement. If the Review Committee has decided to terminate their memberships, the merchants must return the marks issued by HKJGA. Any marks issued by HKJGA may be withdrawn any time if the merchants violate any of the above regulations. HKJGA reserves the right of final decision on and the right to amend the above rules and regulations. 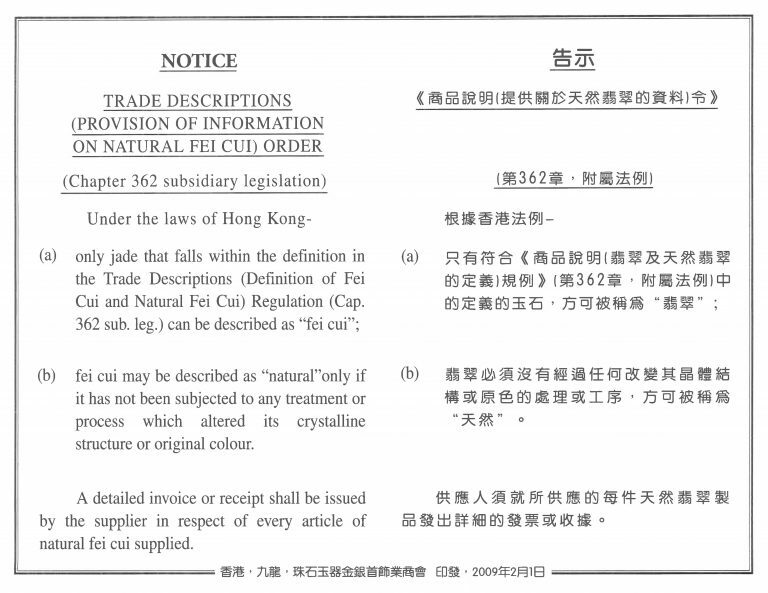 The “Natural Fei Cui Quality Mark” Scheme co-organised by HKJGA and KJMA aims to maintain Hong Kong’s reputation as the shopping paradise with authentic goods, and the ideal destination for natural jadeite. Under the Scheme, Jewellery Trade Laboratory Limited, the long-established subsidiary of HKJGA, is responsible for the accreditation process. Jewellery Trade Laboratory Limited was recognised as an accredited laboratory under the Hong Kong Laboratory Accreditation Scheme (HOKLAS) by Hong Kong Accreditation Service (HKAS) in early 2006, ensuring that all identification certificates issued fully comply with the international accreditation standards. 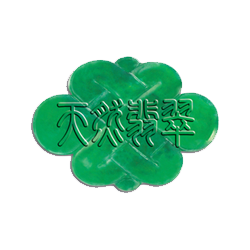 All participating merchants of the “Natural Fei Cui Quality Mark” Scheme can only sell natural jadeite, and agree to the collection of samples by the Associations’ representatives for testing purpose. Those fulfilling the requirements will be granted an annual “Natural Fei Cui Quality Mark” for easy identification. To support the promotion initiatives of the “Natural Fei Cui Quality Mark”, all participating merchants are required to pay a promotion fee, and the difference will be borne by HKJGA and JEWMA. Only merchants that have operated for at least six months and are members of The Hong Kong Jewellers’& Goldsmiths’ Association Ltd or The Kowloon Pearls, Precious Stones, Jade, Gold and Silver Ornament Merchants Association eligible to apply. They must complete and return the application form and the Rules and Regulations signed by the person-in-charge and stamped with the company chop. Applicants must pay an annual testing fee. For security reason, the samples will be sealed at the premises of the merchants, who should send the samples to Jewellery Trade Laboratory Limited at the designated time and date. In case of late submission or incompliance with the instructions, the test will be rearranged by Jewellery Trade Laboratory Limited, otherwise the applicants will be deemed as giving up the application. Qualified applicants will be given the “Natural Fei Cui Quality Mark” after being reviewed by the Jade Team jointly established by HKJGA and KJMA. The mark can only be displayed at the address stated in the application form and must be returned if a merchant closes its business or surrenders its membership. If a piece of treated, resin-filled, dyed or faked jadeite (i.e. non-natural jadeite) is found among the five samples, another five samples will be taken for re-testing and the re-testing fee shall be borne by the applicant. No “Natural Fei Cui Quality Mark” will be given to those failing to pass the test. The “Natural Fei Cui Quality Mark” will be valid for one year. Sample collection and testing will be carried out at least twice a year, and five items will be collected each time. Only qualified merchants can continue to own the mark. Random tests will also be carried out to ensure full compliance with the standards and the testing fee shall be borne by the merchants. Handling of disputes or complaints: In case of complaints, the concerned item will be passed to Jewellery Trade Laboratory Limited for examination and the testing fee shall be borne by the related merchant. The merchant must recall the sold item and provide a full refund immediately if it is proven to be non-natural jadeite. The “Natural Fei Cui Quality Mark” for the year will be terminated and withdrawn if three or more complaints have been proven valid. As the “Natural Fei Cui Quality Mark” will be promoted through mass media, all applicants must pay a promotion fee required by the Associations’ regulations. The difference will be borne by HKJGA and KJMA. The “Natural Fei Cui Quality Mark” will be withdrawn any time if the merchants violate any of the above regulations. HKJGA and KJMA will not be liable for any actions caused by non-compliance with the quality standards. Merchants agree to indemnify HKJGA and KJMA for all losses and expenses incurred by the above disputes or actions. 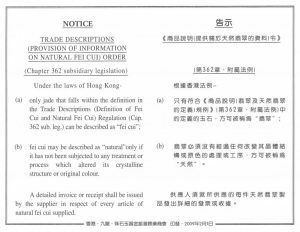 The “Natural Fei Cui Quality Mark” is the property of HKJGA and KJMA, who have the right to withdraw or amend the design. HKJGA and JEWMA reserve the right of final decision on or the right to amend the above rules and regulations. A consumer protection program is being launched by the Diamond Federation of Hong Kong, China Ltd. (DFHK) in 2015. It pledges to offer “Natural, Assurance & Protection” to consumers when purchasing diamonds. It takes pride in consolidating consumer rights and strives to exceed customers’ expectations. The Diamond Federation of Hong Kong, China Ltd (DFHK) is a non-profit organisation and its main objective is to protect consumer interest by standardizing business practices. DFHK has undertaken its mission to uphold Hong Kong’s reputation as a “Shopping Paradise”, “Asia’s Diamond Centre” and “Asia World City” by enforcing the integrity of the diamond industry with uniformed business practices, promoting customer services and protecting consumer rights. DFHK focuses on strengthening the integrity of the diamond industry and promoting consumers’ confidence in diamond. 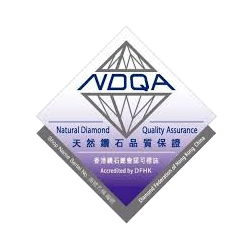 The “Hong Kong SAR Government Trade Descriptions Ordinance” is used as the bases for developing the “Natural Diamond Quality Assurance” Scheme; leading to a win-win-win situation for Hong Kong, the participating retailers and ultimately the end consumers. HKJGA became one of the mark-issuing bodies under the “No Fake Pledge” Scheme in mid-2006. New applicants or members applying for membership renewal must complete and return the related forms to HKJGA in order to join the Scheme. Upon approval of the application, members will receive the “No Fake Pledge” sticker and tent card for 2007 and they must return the 2006 sticker and tent card immediately. In addition, relevant information will be published on the website of “No Fake Pledge” and other promotion materials for consumers and tourists. 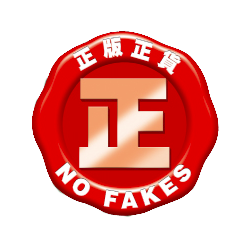 The “No Fake Pledge” mark, sticker and tent card are the property of the Intellectual Property Department. The use of such mark, sticker and tent card on any advertising or promotion materials will be prohibited without the prior written approval of the Intellectual Property Department. Any unauthorised use will violate the intellectual property right. For details, please contact the Intellectual Property Department at 2961 6907.